This article was written by Ted Evans for The Antique Tackle Observer and I thank him for the update. The majority of this article was first published in issue 43 of the ‘Antique Tackle Observer’ during 2005, It was later published on the ‘Classic Rod Forum’ for the members of that website. Publication generated a number of queries asking if the article was definitive for the Lightweight / LRH Lightweight, my answer was no – the article sought only to chart the progress of the development of the reel from its introduction up until its final incarnation. This answer prompted the further the query, “ if this isn’t definitive what else is there”? The reader is invited to read on and discover the dateline of 1939 does not mean there is a lack of variety, rarity, or interest to be found amongst later reels. We wish to show this is untrue and there is much to learn from – and appreciate in – Hardy’s post war output. The company’s policy of continuous development and improvement created many scarce and indeed rare examples amongst reels disparagingly referred to as ‘modern’. Indeed, there are numerous reels manufactured by Hardy’s during the last sixty years with sufficient variation to offer opportunity for the ardent collector to undertake research and discovery. It is regrettable that latter day authors have to date been dismissive of reels from this period – from which we have chosen the ‘Lightweight’ to demonstrate the possibilities open to the collectors who wish to build collections without paying the premium prices commanded by earlier Hardy reels. 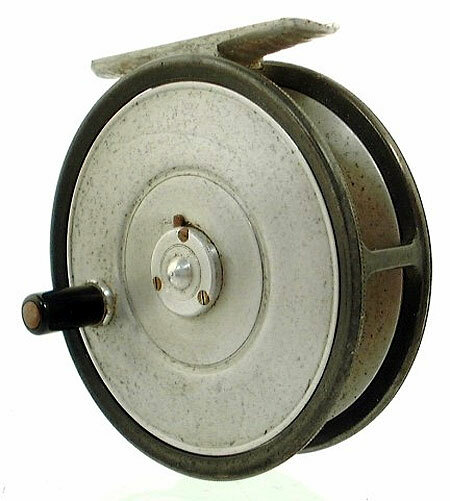 The Lightweight was a reel developed specifically to harvest the commercial advantages demonstrated by the ‘St. 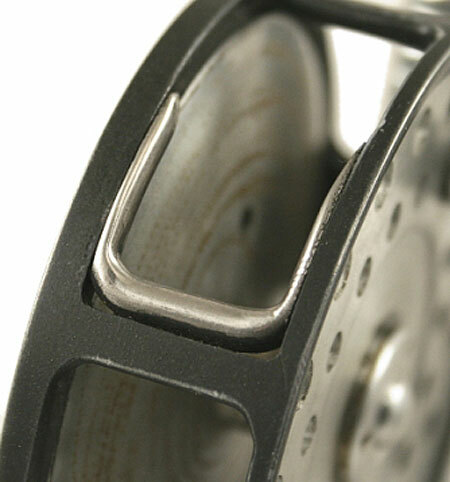 George Tournament’ reel, and was produced by machining additional material from castings used for the 3⅜ inch Uniqua. The resultant frame was then fitted with a semicircular spring secured at one end by a pair of rivets – and bearing on a slotted pawl which is held in position by the familiar disc-headed stud. 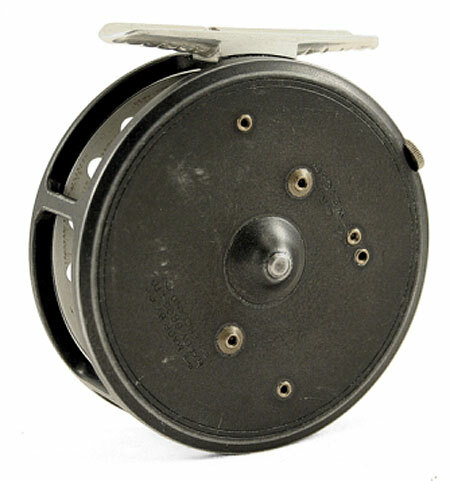 The reel has a 3/16” inch diameter spindle with central relief, a 3-screw drum latch, black composite material handle, and a ribbed alloy foot. The details of the manufacturer and the model name are impressed into the backplate in the familiar curved arrangement of 1/16” inch lettering. Hardy Lightweight 1st Model rear view. The Lightweight was catalogued for 29 years and yet surprisingly little has been written about its development. Though initial inspection supports the view that the reel is of simple construction and relatively uninteresting, closer examination of the various differences shows that the Lightweight enjoyed the same principle of constant improvement and development, as all of Hardy’s other tackle.. The first model Lightweight at 3 ounces weighed less than the 3½ ounces of the lightened St. George. 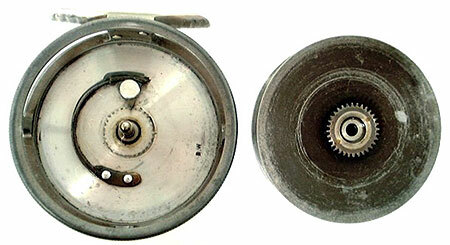 Similarities between the reel’s components which helped achieve this are the single spring for ratchet control – though somewhat more substantial to reflect the different use for which the reel was designed. No regulator or line guide was fitted, and it had a 3/16” inch steel spindle with central relief. 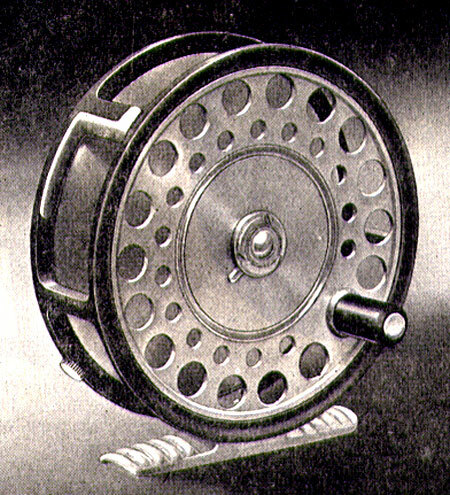 The Lightweight was intended to cater for anglers who required a lighter reel than Hardy’s established models, and it was recommended as suitable for trout rods such as the Fairchild, and the CC de France, etc. It was introduced in the “1936 Supplementary catalogue of Additions and Alterations” with a declared weight of 3½ ounces, reduced in the following catalogue to 3¼ ounces. 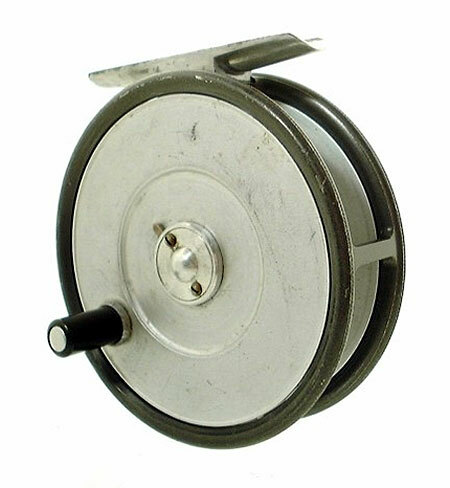 The reel was designed according to conventional principles, and has a constant click check, unperforated line drum, 3- screw drum latch, and a ribbed alloy foot. It was available in 3 3/16 inch size only, with a drum width of ¾ inch. In terms of its line capacity to weight ratio it had a 1-3 ounce advantage over the 3″ St. George, and the 3⅛” inch model Uniqua and Perfect reels. However, it is only the earliest of the reels shown here which manages to beat the scales and comes in at barely more than 3 ounces. The three later models tip the scales at 3½ ounces. 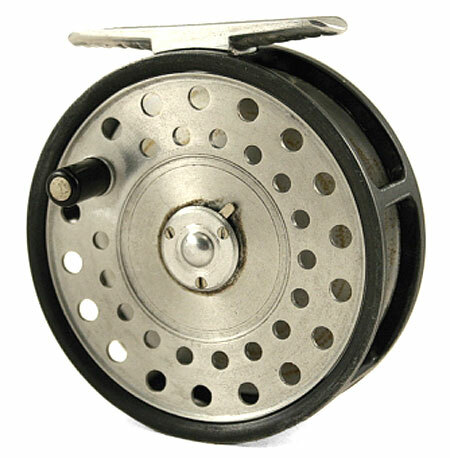 Nonetheless, this reel is remarkable amongst its contemporaries for its slender proportions. The illustration published in the Hardy’s Supplementary Catalogue shows a pattern of 3 rivet heads on the backplate of the reel. 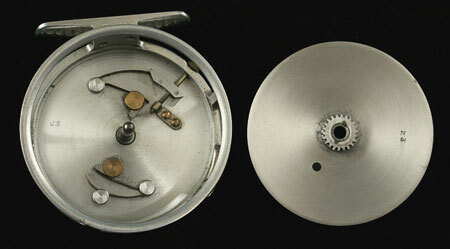 This peculiar arrangement corresponds with the check mechanism unique to the earliest model of the Lightweight and can be seen with our first pictured reel. Hardy Lightweight 1st Model interior view. 2nd. Model Hardy LRH Lightweight 1948 illustration. This catalogue introduced a new reel designated the “LRH Lightweight”. 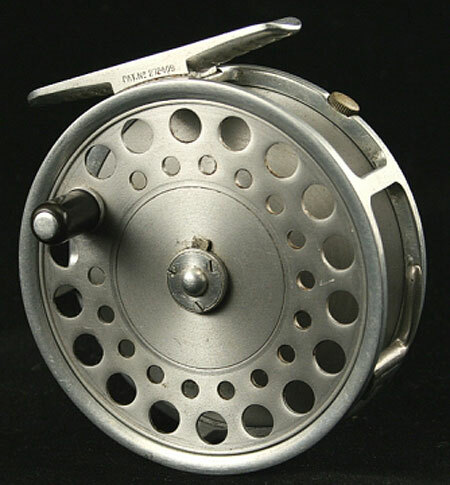 This new reel was also 3 3/16 inch diameter but with the added improvements to the compensating check of a rim mounted regulator, spare spring and pawl, stainless steel line guard, and a perforated line drum. 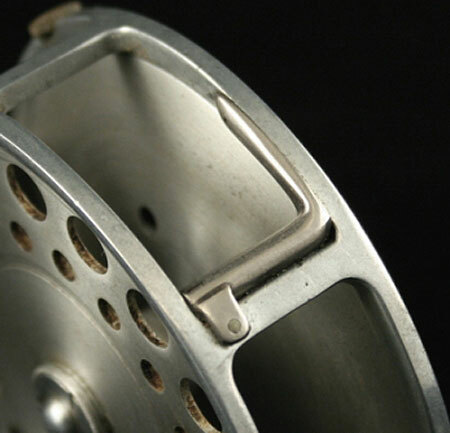 The perforations to the line drum were probably made possible by the increased strength of aluminium now available, and this in turn contained the increase in weight of this new design to ¼ of 1 ounce over the original Lightweight. 1st Model Hardy LRH Lightweight. We show here -perhaps for the first time an LRH with a long twin legged line guide which was never published in Hardy’s catalogues. When we queried this it was suggested that it would have been too time consuming to fit and so was dispensed with in favour of the line guide subsequently pictured on the launch of the LRH reel. One point to note is that the only reels seen with this pattern line guide have each been left hand wind, we have not found a RHW. LRH. with this particular style of guide and so the question remains – do they exist? 1st. Model Hardy LRH Lightweight line guard detail. In addition to these changes, there are two further differences, the significance of which will become apparent later. The first is a minor cosmetic detail concerning the profile of the rims. The Lightweight has a knurled raised edge, whereas the LRH Lightweight has the rim machined flush with the bridges of the frame. The second is the actual number of bridges between the rims. Up until this time, the Lightweight had a frame with three bridges. Hardy Lightweight 2nd Model interior view. 1st. Model Hardy LRH Lightweight rear view. Hardy Lightweight 3rd. Model interior view. The LRH Lightweight frame has four bridges. The next model Lightweight betrays the common origin of the reel frame casting which was used for both the LRH Lightweight and the Lightweight. The practicalities and economics of production suggest that from the time of introduction of the LRH Lightweight – or very shortly thereafter, that the Lightweight was now built on the same frame casting. It required only simple machining of the rims to create the raised knurled edge to the frame. 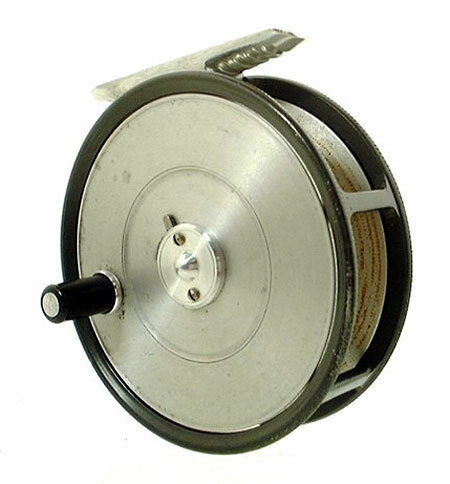 Although the reel we picture here has a four-bridge frame, it also has the later 2-screw drum latch, which places it past the 1950 date line. However, there is something else to be said about the frame – the webs are not symmetrical as can be seen in the photograph of one reel on top of the other. The 1957 catalogue dispels all reasonable doubt that, even in the absence of updated illustration year-on-year for both reels – they were both being assembled from fundamentally similar components. At this time the style of line guard fitted to the LRH was changed, and the original 3-screw latch on both reels had been replaced with the new 2-screw latch. Hardy Lightweight 4th. Model interior view. Before moving on further we show here another LRH which has a silver anodised finish. 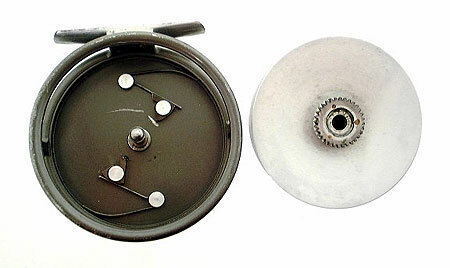 Note the diameter of the three screw latch and its ’L’ shaped lineguide, together with the finer spindle diameter and reduced diameter of the toothed check wheel. Hardy silver anodised LRH Lightweight reel - possibly unique. 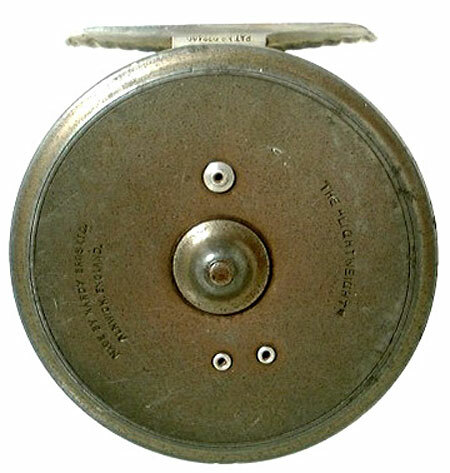 This reel came from the Dunkeld collection and the then owner listed the reel as produced in the 1930s, this is clearly wrong as it has the ‘L’ shaped lineguide suggesting a manufacturing date of around 1947. Hardy silver anodised LRH Lightweight line guard detail. 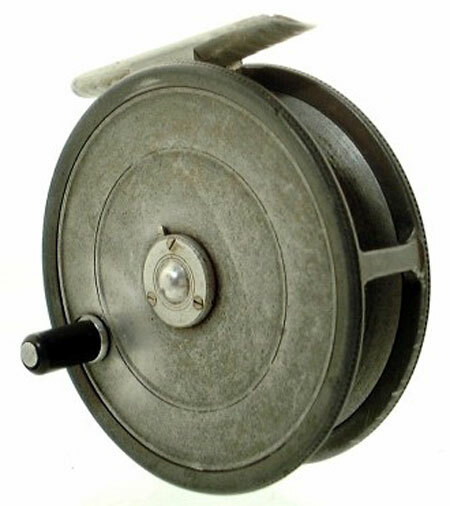 So far we have not found another LRH with a silver anodised finish, reduced diameter three screw latch, reduced size of toothed wheel for the check, and the fine spindle – all of which this reel contains. Hardy silver anodised LRH Lightweight interior view. What is not apparent from the catalogue is the increase in diameter of the spindle from 3/16 to ¼ inch. 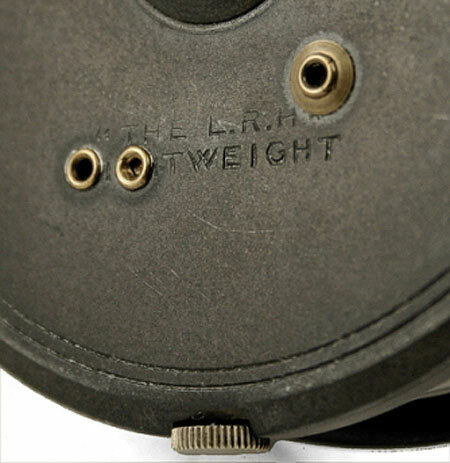 Surely it is not coincidence that the spindle of the Lightweight was also increased from 3/16 to ¼ inch. 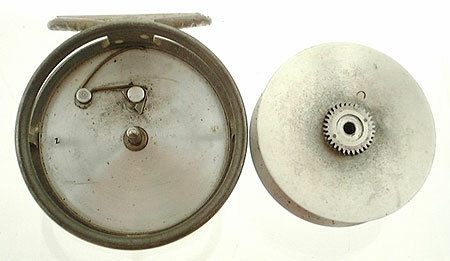 To argue whether the improvements detailed above were developed for the Lightweight, and that the LRH Lightweight was the same reel with ‘bells and whistles’, or whether the LRH Lightweight was designed on a clean sheet of paper and its improved features were incorporated into the Lightweight is futile. Hardy silver anodised LRH Lightweight rear view. However, to suggest the LRH Lightweight is simply a ‘Lightweight de Lux’ would seem entirely reasonable. Before moving to the concluding reel in this chapter, there is a possible missing version of the Lightweight reel which we must consider. Is there an as yet undiscovered Lightweight with a four-bridge frame and a 3-screw latch? Hardy’s illustrated their 1960 catalogue with the first new picture of the Lightweight since its introduction. It has a four-bridge frame, a 2-screw latch, and a ribbed alloy foot. This is the pattern we believe was in production from 1957. Referring once again to the catalogue listing for the LRH Lightweight – this time in the 1962 Anglers Guide and Catalogue, we can establish a likely dateline for our last variation of the Lightweight. If we refer to the text accompanying the entry for the LRH Lightweight we see that the reel was “Optional right and left-hand Wind” whereas previously – the reel was available as left-hand wind at extra cost. 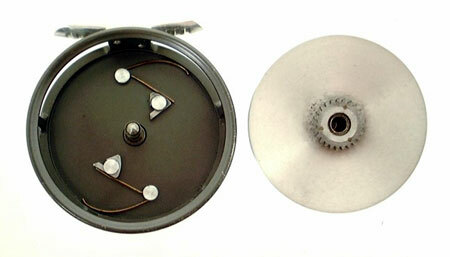 The conclusion is that the new reversible line guard was now fitted to the reel. Furthermore, the reversible line guard necessitated the 3-bridge frame in order that it could be attached to the bridge in the 6 o’clock position. If we accept that the same frame would henceforth be used for the Lightweight, the date line for our last reel is 1962. Though Hardy’s published an up to date picture of the LRH Lightweight in the 1963 catalogue which shows the reel also has a smooth alloy foot, the Lightweight was not so fortunate, and it did not appear in the 1964 catalogue. To conclude, there is much of interest still to be gleaned from a study of post 1937 Hardy’s reels. We urge other collectors to watch out for those reels with variations which still pass through auctions and dealers hands unnoticed and unrecognized, these will be the rarities of tomorrow. This entry was posted in Hardy LRH Lightweight Reel, Hardy Reels. Bookmark the permalink. My question is, when was this reel made? I have a LRH lightweight with a riveted “L” shaped line guard, RHW, 2 screw latch, ribbed reel foot, 4 pillers, stamped 30 Y on the inside. Do you have any idea of its age? 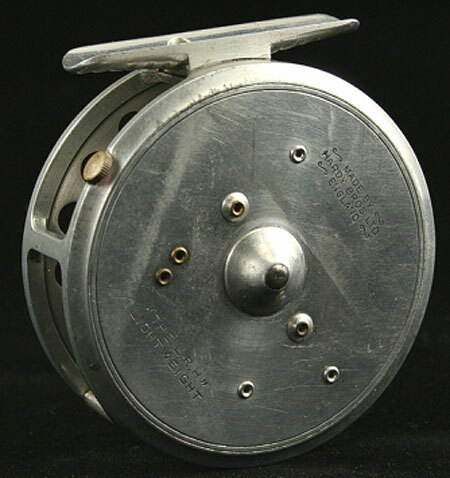 I think that the ribbed latch is somewhat different than on other L.R.H Lightweight reels I have seen – Would you say it was a – variation of some sort ? I have what I believe to be a first model LRH with a long twin legged line guide in RHW as described above if anyone is interested. In near mint shape with original box.